The research is the first to catalog the genetic variation of microbes that live in the gut, where they extract nutrients from food, synthesize vitamins, protect against infections and produce compounds that naturally reduce inflammation. The widespread genetic diversity uncovered by the scientists can help them understand how our microbial genes work together with our human genes to keep us healthy or, in some cases, cause disease. A new study suggests that the collection of microbial DNA in the gut is just as individualized as our own human DNA. The research, by scientists at Washington University School of Medicine in St. Louis and the European Molecular Biology Laboratory in Heidelberg, Germany, was published online Dec. 5 in Nature. The study, by researchers at Washington University School of Medicine in St. Louis and the European Molecular Biology Laboratory in Heidelberg, Germany, was published online Dec. 5 in Nature. The researchers analyzed the microbial DNA in 252 stool samples from 207 individuals living in the United States and Europe. All the subjects had participated in one of two recent high profile initiatives to catalog the diverse species of microbes that live in and on the body. Neither of those studies – the Human Microbiome Project, funded by the National Institutes of Health, and the Metagenomics of the Human Intestinal Tract (MetaHIT) project, funded by the European Commission – looked at the genetic variation of the microbial genomes in the body. For the new study, the researchers zeroed in on 101 species of microbes commonly found in the intestine, identifying more than 10 million single-letter changes in the collective DNA of those microbes. They also found numerous other DNA alterations, including insertions, deletions and structural changes. In 43 subjects for whom the researchers had two stool samples collected at least a month apart (most were collected six months to a year after the initial sample), the researchers found little variability in the microbial DNA over time, although the species of microbes in the intestine fluctuated. Babies become colonized with microbes as they pass through the birth canal and into the world. Those microbes come from their mothers and from the environment. 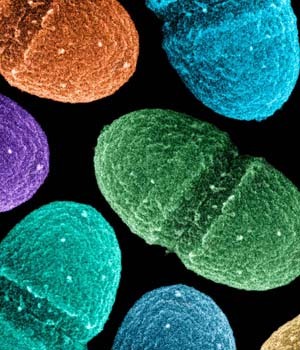 Exactly how the microbes shape our lives is not yet known. But in the gut, research has suggested that an imbalance of bacteria may contribute to irritable bowel syndrome, Crohn’s disease and even obesity. With this new catalog, the researchers can begin to understand the selective forces that shape the intestine’s microbiome – the collection of microbes and their genes. The information gleaned from future studies of the gut microbiome also may help scientists determine how the microbial genes can be manipulated to improve human health and the effectiveness of certain medications, she adds. Schloissnig S, Arumugam M, Sunagawa S, Mitreva M, Tap J, Zhu A, Waller A, Mende DR, Kultima JR, Martin J, Kota K, Sunyaev SR, Weinstock GM, Bork P. Genomic variation landscape of the human gut microbiome. Nature. Dec. 5, 2012. This research is funded by European Molecular Biology Laboratory, the European Community’s Seventh Framework Programme via the MetaHIT grants (HEALTH-F4-2007-201052 and HEALTH-F4-1010-261376) as well as from the National Institute of Health grants U54HG003079 and U54HG004968.